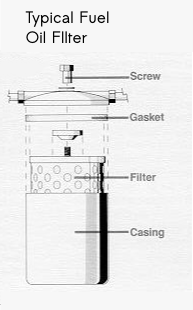 The oil filter, regularly overlooked by oil service engineers or those posing as service engineers. This small but important part of your oil line needs to be inspected and replaced at regular intervals (usually your annual service if using kerosene). Failure to do so can result in fuel starvation at the boiler and ultimately a breakdown and call-out cost. Regular inspection is doubly important if you have an ageing steel tank as these tend to accumulate more ‘crud’ than the newer plastic tanks. For the cost of between £5.00 and £7.50 a year this represents a good investment when compared against the reduced efficiency of the boiler and a potential call out fee. This entry is filed under Your Fuel Tank and tagged filter, heating, oil.